OXFORD, Ohio – Too small to succeed. That has been the label given to Anthony Louis his entire life, but he continues to rack up the points despite his detractors’ criticism. 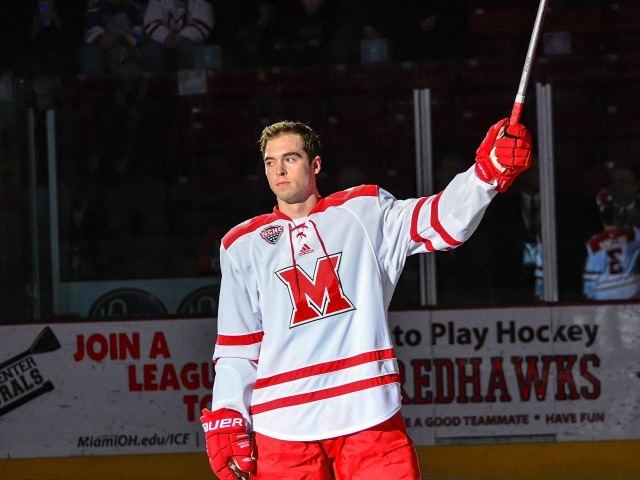 The senior forward who is listed at 5-feet-8, 158 pounds has climbed Miami’s all-time points leaderboard in his four years in Oxford and is currently 22nd in team history with 125 on 45 goals and 80 assists. Anthony Louis with Team USA in 2012-13 (photo by Cathy Lachmann/BoB). Louis grew up in Winfield, Ill., a far west suburb of Chicago but now lives slightly closer to the city in West Chicago. 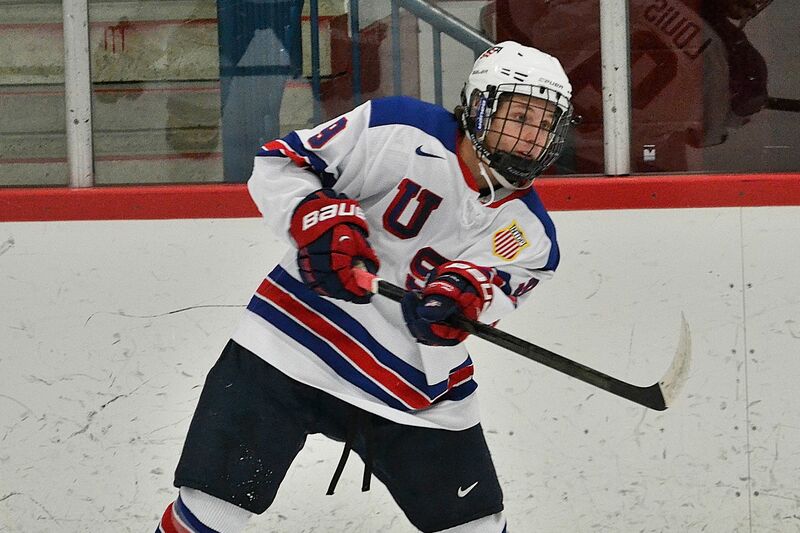 He scored 60 times in 66 games between Team Illinois’ Bantam Major and his Under-16 seasons, earning his way onto the U.S. National Development Team. On the Under-17 team in 2011-12, he netted 27 goals in 49 games, and he was second on the Under-18 team with 51 points the following season, second-best on the team despite facing much tougher competition. Louie Belpedio, MU’s captain and junior defenseman, played and lived with Louis in Ann Arbor on the USNDT. Belpedio is also from Chicago, and with the tandem’s dads being longtime friends, so too have Belpedio and Louis. Louis turned those negative stereotypes into positives, and he said he developed a thick skin when it comes to dealing with negative comments surrounding his play. He earned a silver medal his final season prior to college with the U-18 squad, and Louis also keyed a Four Nations championship by recording five points in four games. Despite that resume, every team in the NHL passed him by with their first six selections of the 2013 draft. That is, until the Stanley Cup champion Blackhawks picked him last in that round. 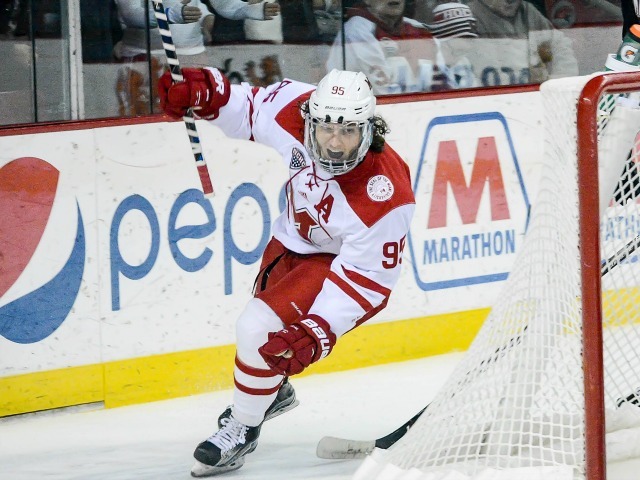 Louis is named to the NCHC All-Tournament team in 2013-14 (Cathy Lachmann/BoB). The hometown Louis was the 181th overall pick in June of 2013. Following in a familiar line of players from the Chicago area, Louis chose to play for Miami, where he began his career in the fall of 2013. 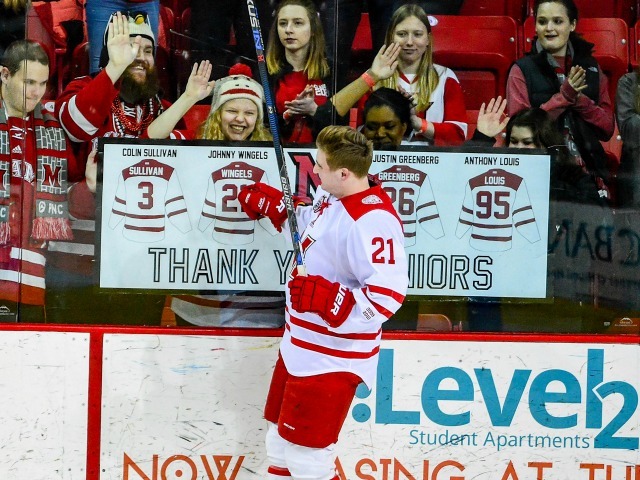 Knowing the Wingels brothers – NHLer Tommy and brother Johnny, a current senior and student coach – helped seal his decision. 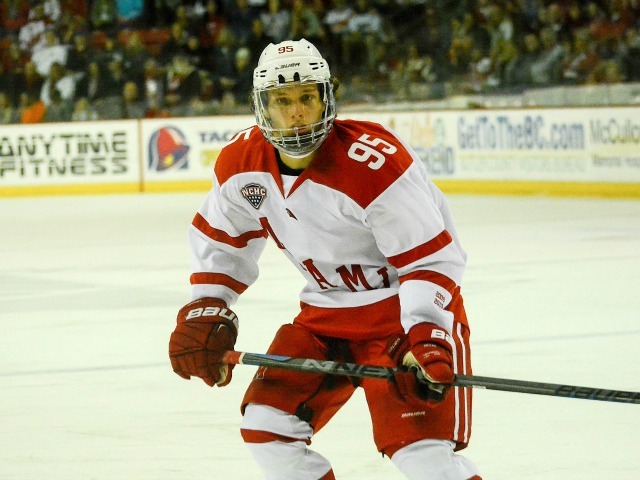 He said the combination of playing against international competition like in the Four Nations tournament parlayed with the U.S. team taking on college teams in exhibitions prepared him for life in Division I college hockey. 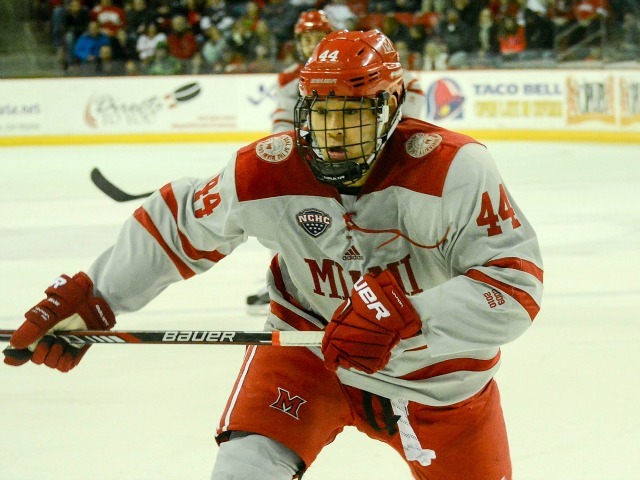 But it was a slow start for the offensive whiz, as he was limited to four goals and three assists in his first 17 games wearing a RedHawks sweater. Anthony Louis in the outdoor game at Soldier Field his sophomore season (Cathy Lachmann/BoB). Louis began to thrive as that season progressed. He recorded eight goals and seven assists the final 15 games, notching points in all four of Miami’s postseason games. 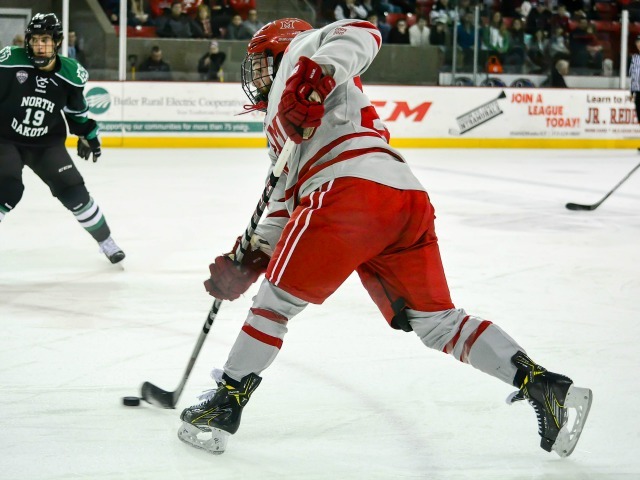 While the RedHawks fell a goal short in the NCHC Tournament championship game, Louis earned a spot on the All-Tournament Team as he finished that event with four goals and a pair of helpers. 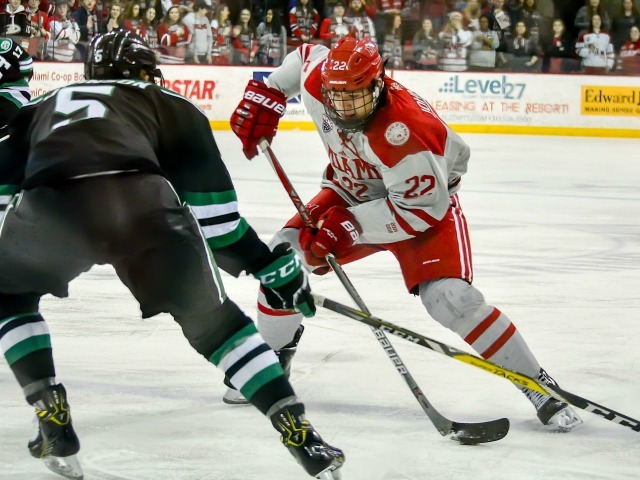 Louis followed up on that campaign by tallying nine goals and a career-best 27 assists as a sophomore, and once again Louis exceled as games became more important. He scored twice and set up five more goals in six postseason games, including a 1-1-2 line vs. Providence in his lone NCAA Tournament contest. 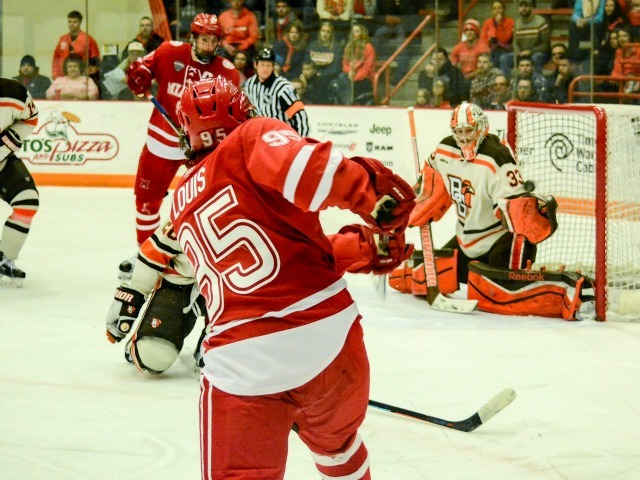 Louis scores on this shot at Bowling Green his junior season (Cathy Lachmann/BoB). 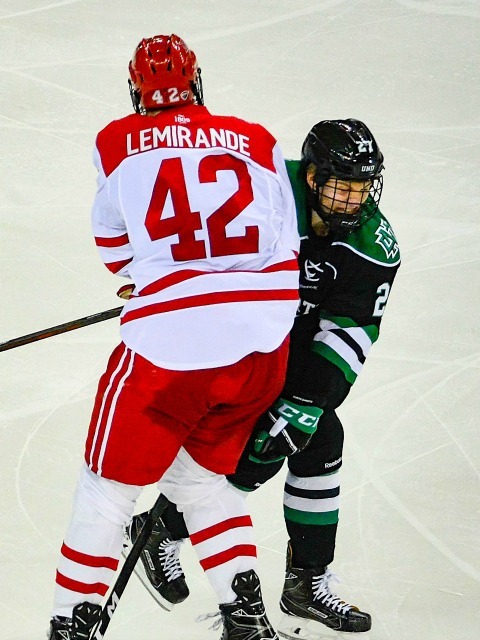 In his junior season, Louis amassed 11 markers and 15 assists, and although Miami was limited to two playoff games – in the first round of the NCHC Tournament at Minnesota-Duluth – he scored once and dished for two helpers in that series. 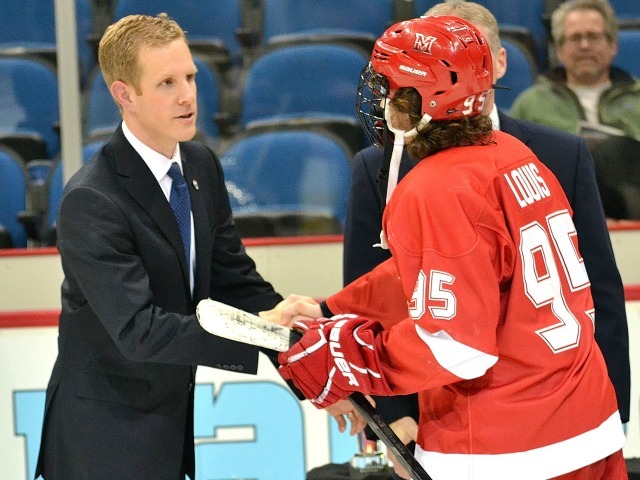 That gave Louis a career 7-9-16 line in 12 postseason games his first three seasons in Oxford, as he has loved college hockey’s spotlight. Named an assistant captain last summer, Louis’ goal and points totals are career highs, as he is 13-24-37 this season. 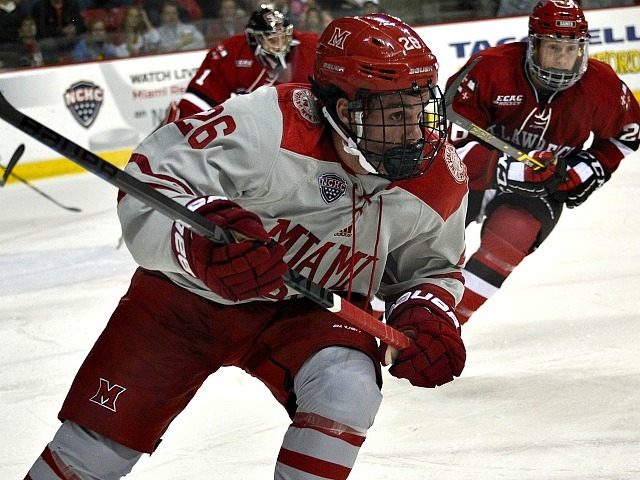 For his career, he has 45 goals and 80 assists for 125 points, ranking him 22nd all-time among RedHawks skaters. 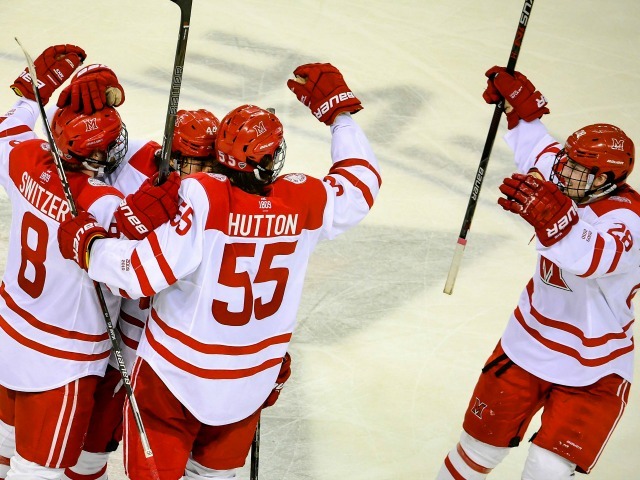 Louis celebrates after scoring vs. UNO his senior year (Cathy Lachmann/BoB). One more point would move Louis into a three-way tie for 20th. But beyond the offensive stats, Louis has worked to become a more complete player in his four years at Miami. 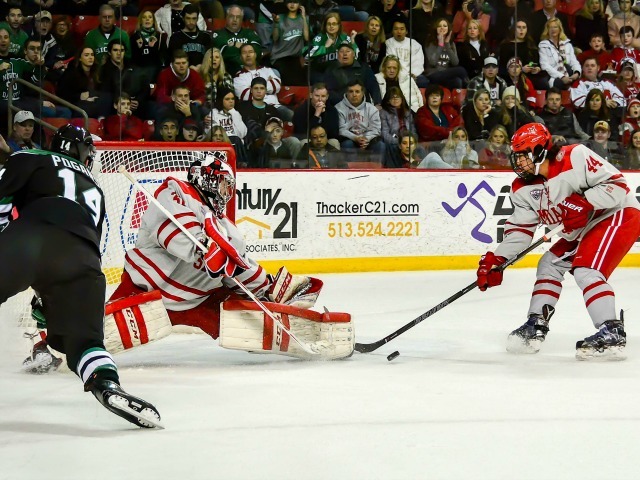 “My defensive game has gotten much better – this is my first year of penalty killing,” Louis said. Louis is also proud of how much physically stronger he has become since that freshman campaign. Belpedio has been impressed with Louis’ leadership this season. Louis is set to graduate in May, when he will earn a degree in sports management. From there it’s on to the pros, and no matter how his future career in hockey evolves, he will always cherish his Miami years. Miami has not won in six weeks, but its next loss will be its last of the season. 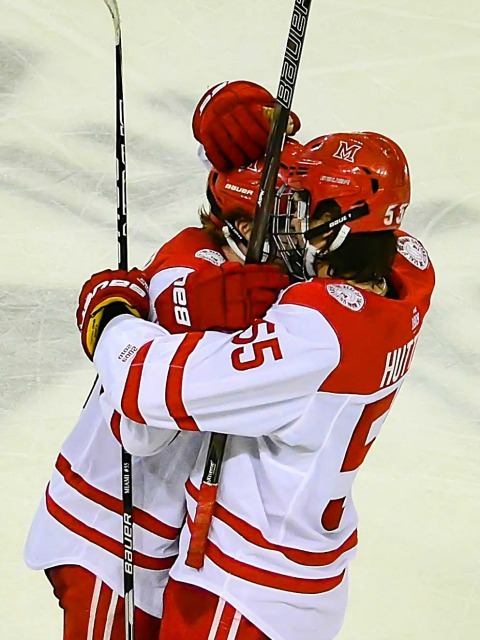 The RedHawks lost their NCHC Tournament first-round opener in their best-of-3 series, 5-4 in overtime to Minnesota-Duluth at Amsoil Arena on Friday and now face elimination in that series. Miami’s path from here on out couldn’t be more clear: Win or go home. The RedHawks would need to win on Saturday and Sunday at No. 3 UMD then run the table in the semifinal and final of the league tournament in Minneapolis. That would earn them a berth into the NCAA Tournament, which, of course, is one and out. An unlikely scenario made more improbable considering the first half of the opening sentence. Miami is 0-8-1 in its last nine and 1-11-2 since Jan. 14. 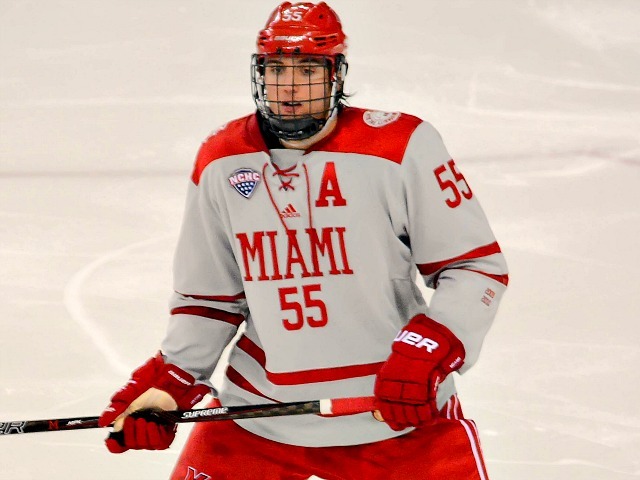 To Miami’s credit, it took the third-best team in Division I to overtime in the Bulldogs’ home building on Friday despite missing captain Louie Belpedio and losing stud goalie Ryan Larkin in the second period. The RedHawks led three times in the game (2-1, 3-2 and 4-3) but were unable to close out the win, a common theme in 2016-17. 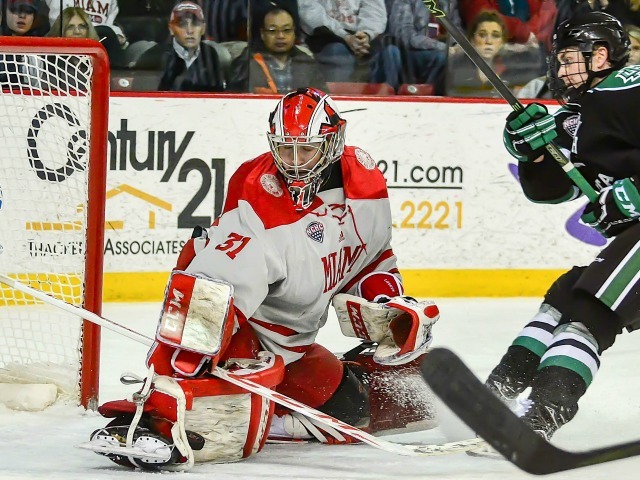 Backup goalie Chase Munroe had not logged a minute in exactly three months, and after stopping just three of the first five shots he faced, he turned aside 26 of the final 28. He faced a shooting gallery in the final 20 minutes of regulation and overtime, and didn’t get a lot of help from his skaters defensively. It would’ve been easy for this team to mail it in, considering the near impossibility of its task of winning this tournament. But the RedHawks didn’t quit, and in a season that will likely go down as their worst in a quarter century, that’s an encouraging sign. 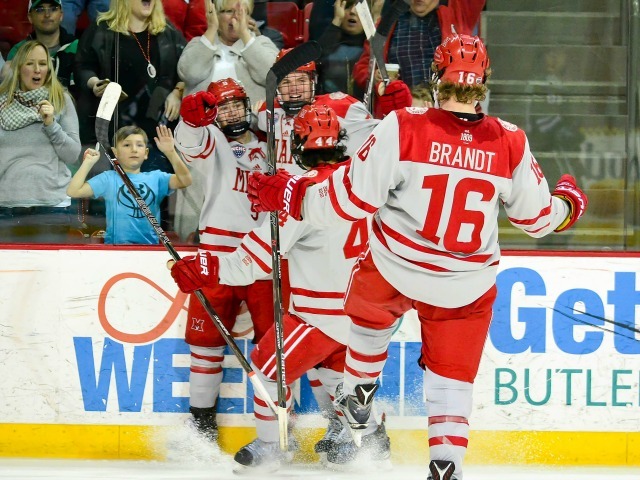 Crazy things happen in conference tournaments, and it would take a run that makes 2013-14 look tame just for Miami to return the position it was in three years when it came within a goal of advancing to the NCAAs despite a 12-19-3 regular season record. The RedHawks have their backs against the boards but are playing with passion, and in Game 2 we’ll see if that’s enough to extend the season. – No idea what Larkin’s injury is or how severe, but when a goalie leaves a game and doesn’t return he rarely returns the next night. Already Belpedio-less, that makes MU’s chances of advancing in this round even more remote. If there is a bright spot it’s that Munroe earned valuable conference tournament experience, and as we recall, Jay Williams was shaky early before finding his groove, as was Charlie Effinger before him. 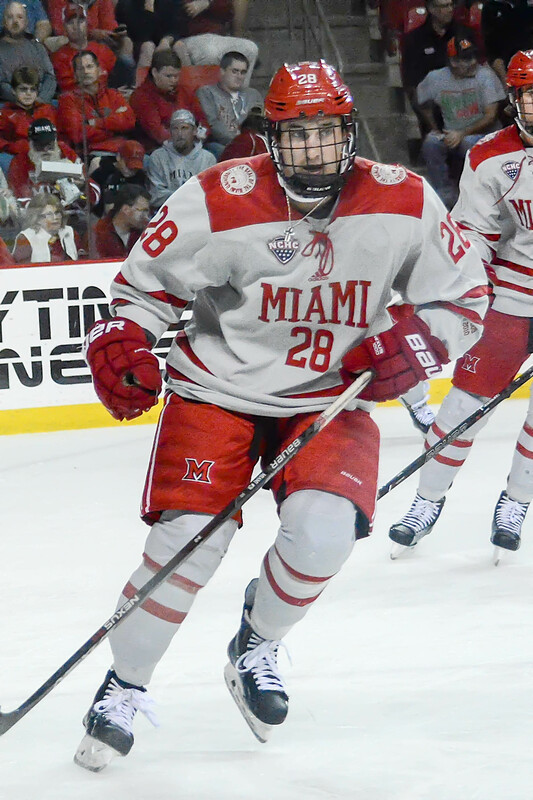 Miami forward Zach LaValle (photo by Cathy Lachmann/BoB). – Scorers’ list from Friday boom: Ryan Siroky and Zach LaValle, in the bottom six of the forward list on the lineup card all season, both scored in this one. It was just their third and second goals of the season, respectively, although LaValle especially seems to have picked it up a notch recently. This is encouraging because Miami was able to hang without its go-to snipers finding the net, and also the lack of scoring from non-top six forwards has been well documented here. – Scorers’ list from Friday bust: Josh Melnick hasn’t scored in seven games and Anthony Louis has been stuck on 13 goals for 13 games. Kiefer Sherwood was limited to one shot. Scoring from tertiary forwards is great, but the top players need to be top players in the playoffs for teams to advance. – Yet another Gordie Green update. Hate to be redundant but Green has been the hottest forward on the team with seven points in four games and 11 in his last 10 – more than anyone else on the team. – Speaking of points surges, two assists on Friday give Grant Hutton eight points in his last seven games. He picked up three helpers the first 28 games but has five in the last seven. 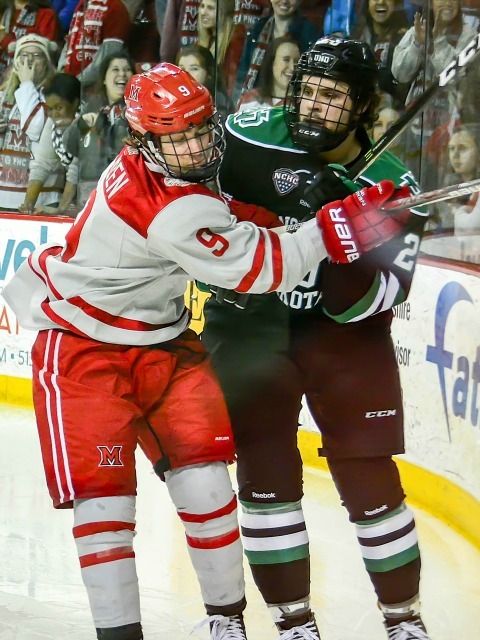 On a team that has struggled mightily the past two months, it says a lot that a pair of underclassmen in Green and Hutton are two of the RedHawks’ top points producers. Green is a freshman and Hutton is a defenseman. – Shots were close the first two periods: 14-12 UMD. Shots after: 27-10 UMD. Miami has now been outshot in 13 straight regulation periods. 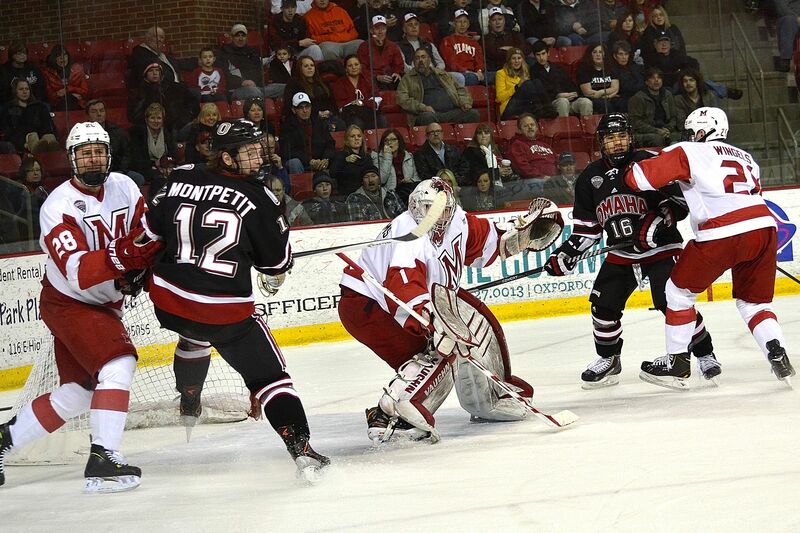 The RedHawks have allowed 474 shots while generating just 320 during their current 1-11-2 skid. Miami had played in 10 overtime games this season without suffering a loss. That streak was broken on Friday, as No. 3 Minnesota-Duluth edged the RedHawks, 5-4 in an NCHC Tournament best-of-3 opener in the quarterfinal round at Amsoil Arena. Alex Iafallo skated behind the crease and had his wrap-around denied by MU goalie Chase Munroe, but Dominic Toninato was there at the top of the crease to slam home the game winner 7:24 into the extra session. Miami is winless in its last nine games, going 0-8-1 in that span, and faces elimination on Saturday. Parker Mackay stole the puck from Josh Melnick, skated across the slot and wristed one home to give Minnesota-Duluth the lead 5:21 into the first period. Miami (9-19-7) answered with a pair of goals in the next 64 seconds. On a 2-on-1, Gordie Green passed through the slot to Zach LaValle, who skated around sprawled-out UMD goalie Hunter Miska and deposited the puck in the net to tie it. Carson Meyer put the RedHawks ahead when he beat two defenders to a loose puck to gain the zone then ultimately grabbed the rebound off an outside shot from Anthony Louis, burying it to make it 2-1. 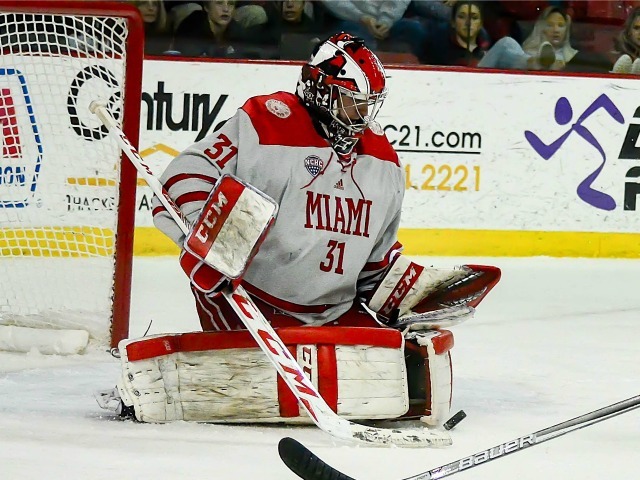 Moments later, there was a pile-up in the Miami crease, and RedHawks goalie Ryan Larkin was injured. He did not return and was replaced by Munroe, who had not played in a game in three months. 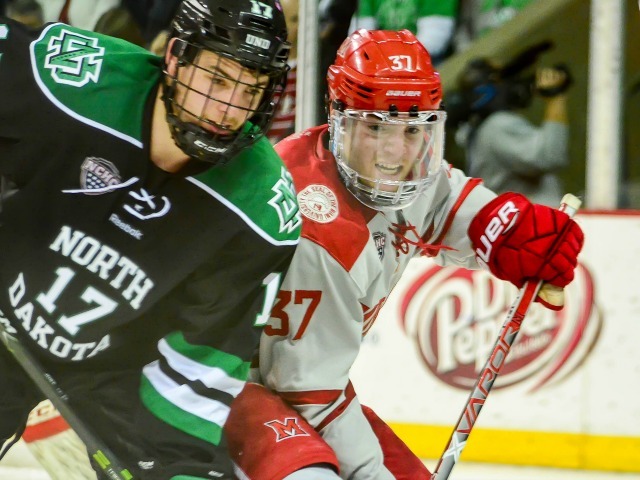 The Bulldogs (22-6-7) tied it at two when Nick Wolff fired a blue line shot that caromed off the end boards to Riley Tufte, who was wide open at the side of the net for a tap-in at the end of a long shift with 16:16 left in the second period. Green one-timed a shot from the slot off a pass by Grant Hutton from behind the UMD net as Miami regained the lead, 3-2 with 4:06 remaining in the middle stanza. That RedHawks lead was short-lived, as Iafallo skated the length of the ice on a 2-on-2, crashed the net and backhanded it past Munroe to tie it just 43 seconds later. Miami took its third lead of the game with 8:46 to play in regulation when Ryan Siroky whipped a puck on net from along the boards, and it hit a body in the slot, trickling past Miska. Once again, Minnesota-Duluth answered quickly, as Karson Kuhlman slid a pass through two defenders to Tufte, who was wide open in the slot. 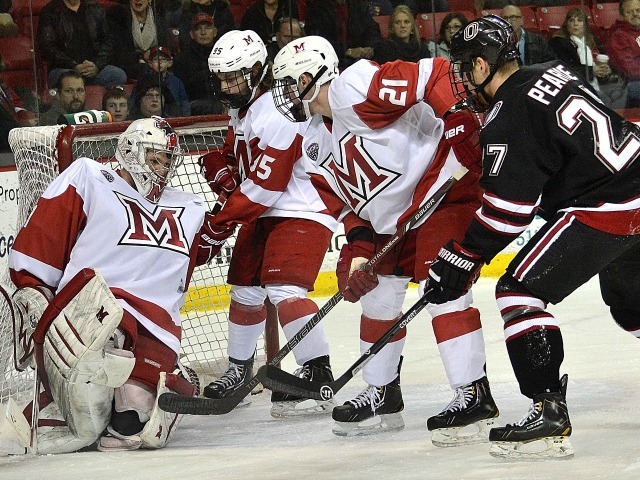 Munroe made the initial save but Tufte corralled his own rebound and scored just 65 seconds after the RedHawks’ goal to make it 4-4. Green finished with a goal and an assist, giving him helpers in four straight games and seven points in that stretch. Hutton earned a pair of assists and has 10 points in his last 11 contests. Game 2 is scheduled for 8:37 p.m. on Saturday. 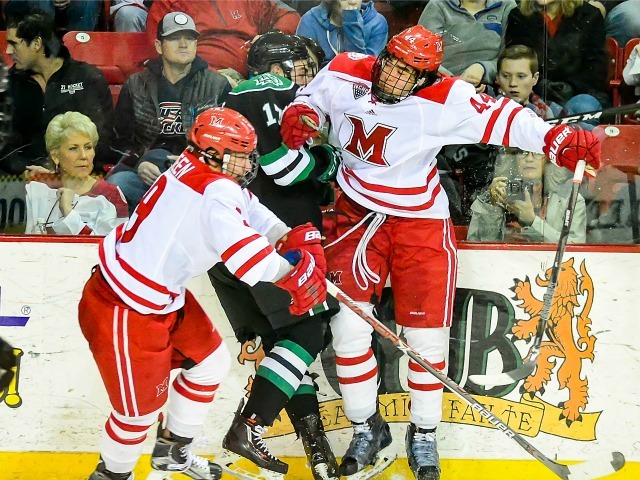 Images from the North Dakota-Miami series played at Cady Arena in Oxford, Ohio, on March 3-4, 2017. All photos by Cathy Lachmann/Blog of Brotherhood. OXFORD, Ohio – Eleven shots on Saturday, 27 for the weekend. 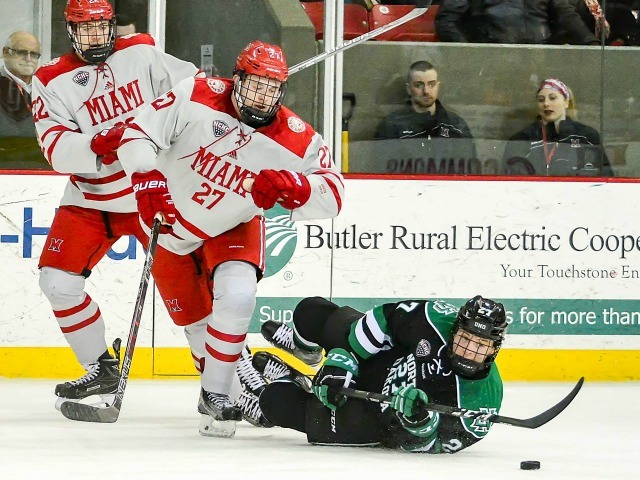 Not surprisingly, Miami was swept by North Dakota, losing 5-2 on Saturday in the regular season finale at Cady Arena. BoB has spent all season analyzing stats, but it doesn’t take a genius to figure out the above are not going to get you many wins. One more stat: One win since Jan. 13. Hoping for a miraculous turnaround at Minnesota-Duluth next weekend. FORWARDS: F. Six of those shots were by forwards. Six. That’s one every 10 minutes. 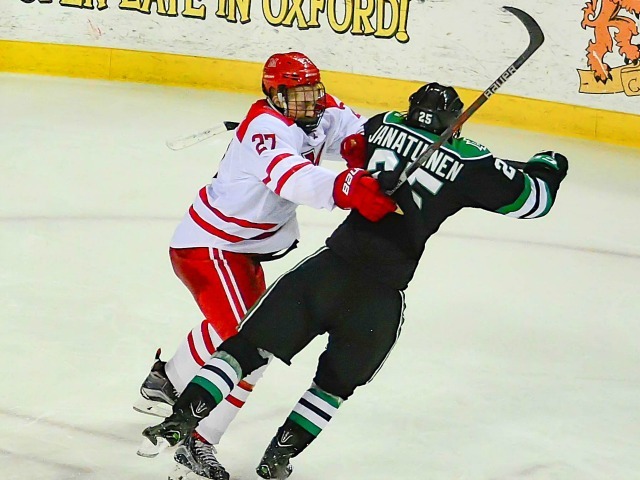 Again, not much else to say, other than Carson Meyer got abused by Tucker Poolman in a 1-on-1 for the second UND goal after Conor Lemirande committed an offensive-zone turnover for the first. Could’ve gotten a ‘G’ or ‘H’ if it wasn’t for Kiefer Sherwood’s rebound goal. DEFENSEMEN: B-. Still need to see better coverage in the slot and around the crease, but this group was more physical and limited UND to 27 shots. Plus Grant Hutton’s shot led to Sherwood’s rebound goal, and Chaz Switzer scored the other. GOALTENDING: B-. Besides the empty netter, goalie Ryan Larkin allowed two goals to wide-open players in the slot, one on a skated who was allowed to skate around the crease and jam one in and another on a 2-on-1. And he made two spectacular saves. Miami won nine games this regular season, and that number would’ve been lower if Larkin hadn’t been in net. LINEUP CHANGES: It appears less likely that Louie Belpedio will return for next weekend’s series, which hurts Miami’s chances. He is still in a knee brace. 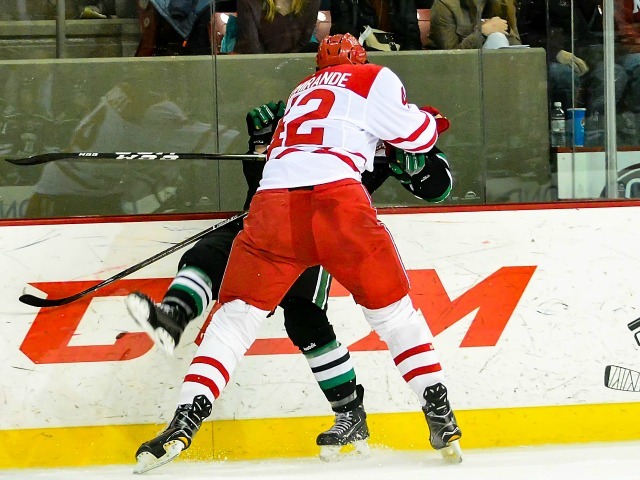 Willie Knierim missed this game after blocking a shot on Friday. Alex Alger dressed in his place. OXFORD, Ohio – The end of the regular season couldn’t come quickly enough for Miami. The RedHawks lost their finale, 5-2 to No. 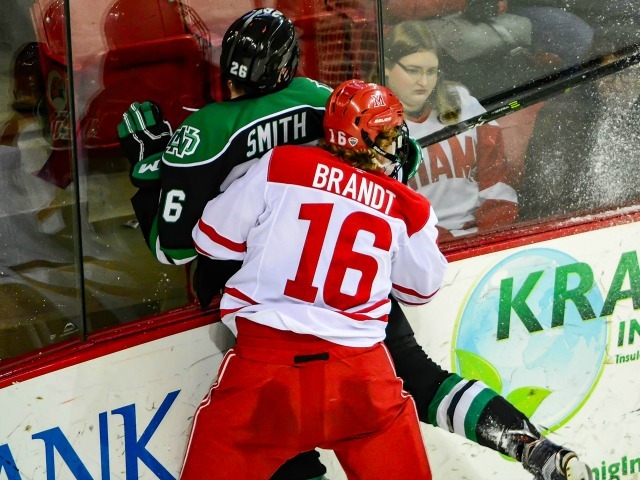 15 North Dakota on Saturday as they will limp into the playoffs with an eight-game winless streak and one victory in their last 13. 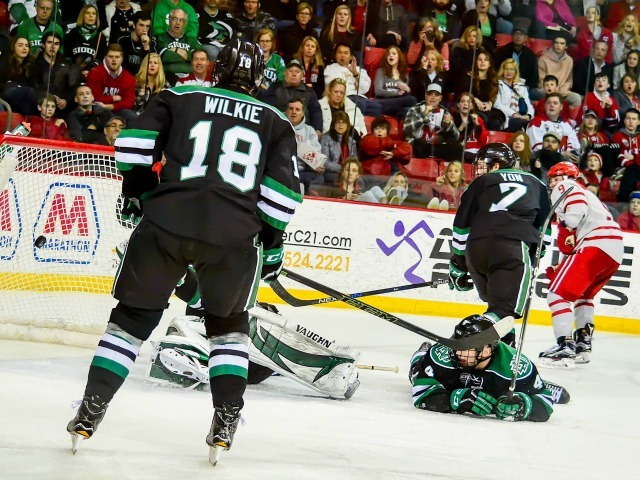 After a scoreless first period, the Fighting Sioux took the lead 2:34 into the second period when Ludvig Hoff stole the puck from Miami’s Conor Lemirande and threaded a pass to Chris Wilkie, who was wide open in the slot and wired a shot home. 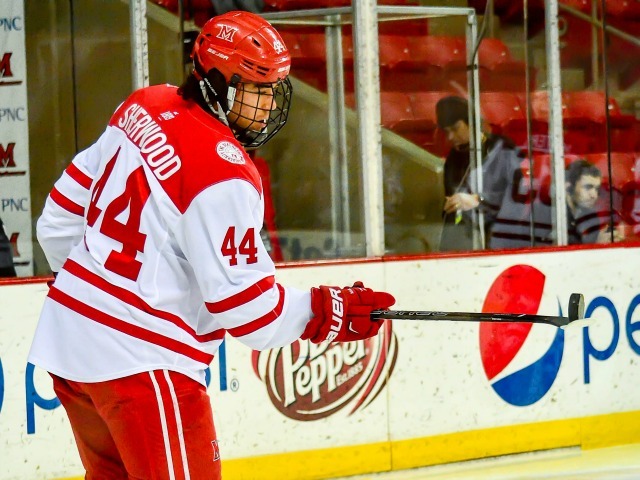 The RedHawks (9-18-7) tied it on the power play when Grant Hutton fired a shot from just inside the blue line, and after goalie Cam Johnson made the initial save, Kiefer Sherwood slammed home the rebound from the side of the net with 14:51 left in the middle stanza. UND (18-14-3) went ahead for good with 4:24 left in that frame when Tucker Poolman took the puck from along the boards, skated from behind the net to the top of the crease and buried a backhander just under the crossbar. On a 3-on-2 break, Poolman fed Trevor Olson in the slot, and Olson found the net to make it 3-1 with 15:42 left in regulation. 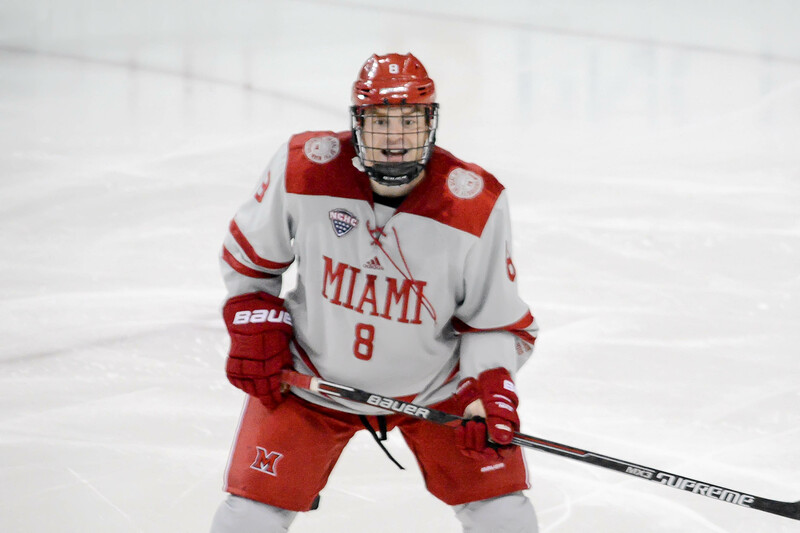 Miami did trim the lead to one when a blue line blast by Chaz Switzer tricked through Johnson with 11:12 to play for Switzer’s first career goal. But 35 seconds later, it was Poolman again, scoring off a Dixon Bowen feed on a 2-on-1, giving North Dakota a 4-2 lead. Bowen sealed it with 3:30 to play with an empty netter. Sherwood finished with a goal and an assist, accomplishing that for the second straight game as he ended the weekend with a team-best four points. The RedHawks were limited to 11 shots, their lowest total in the Cady Arena era and one off the team record low of 10, which Miami ended up with twice, most recently in 2000 vs. Michigan. 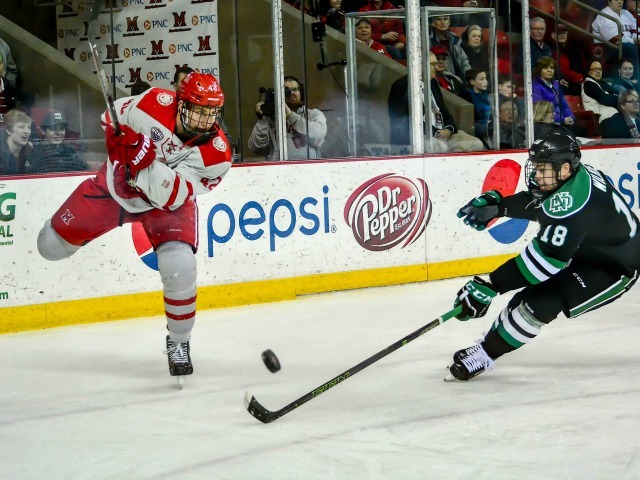 Miami had already locked up a seven seed in the NCHC Tournament, which starts next weekend. The RedHawks will travel to Minnesota for a best-of-3 series in the opening round against third-ranked and second-seeded Minnesota-Duluth. The games will be on Friday, Saturday and – if necessary – Sunday. Miami needs to win that tournament to advance to the NCAA Tournament. 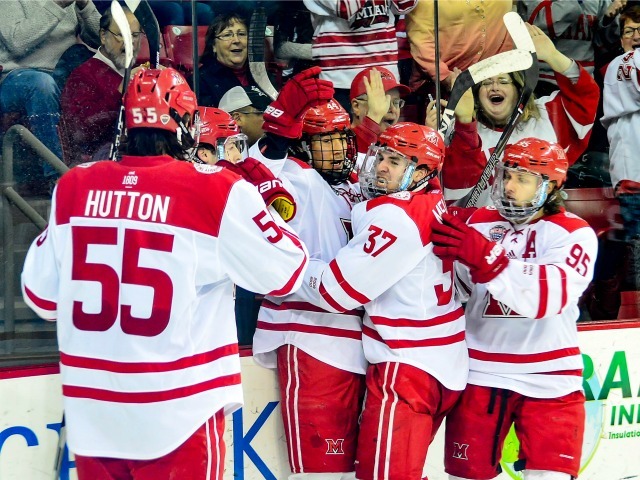 OXFORD, Ohio – For Miami, PairWise doesn’t matter, seeding has been wrapped up and the RedHawks even know their first-round opponent in the NCHC Tournament. That means after Friday’s 3-2 loss to North Dakota, Saturday’s regular season finale will be little more than a glorified exhibition. For official purposes that is. Miami can certainly conjure up reasons to take its last game at Cady Arena in 2016-17 seriously. Trying to gain momentum heading into a brutal road trip – the same one that saw the RedHawks’ season end last year – would be the most obvious. 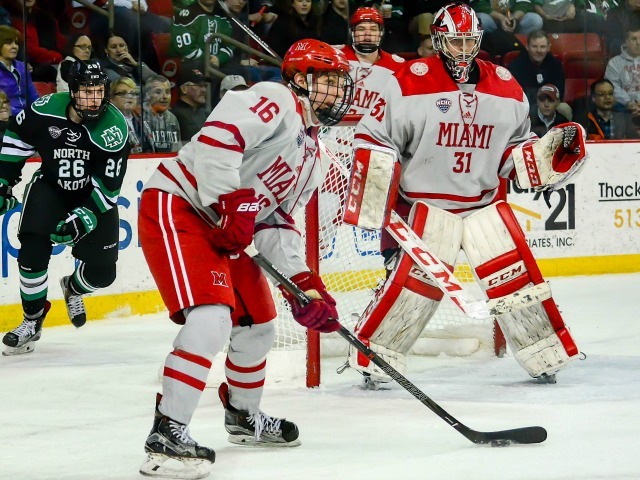 But it’s been no secret Miami would open the NCHC Tournament on the road for weeks now, and the RedHawks still went winless the entire month of February and have opened March 0-1. 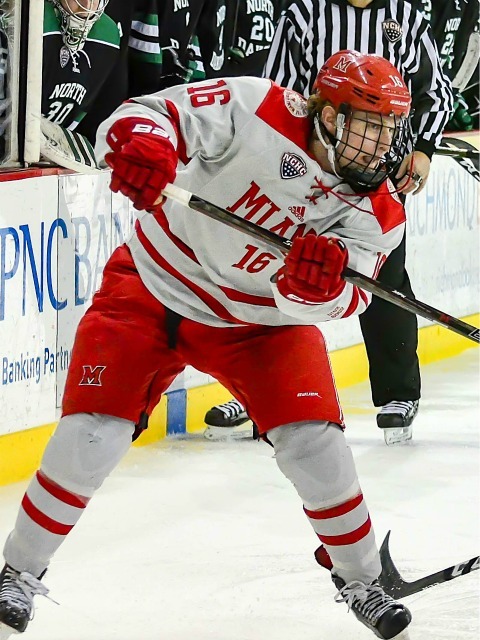 Next week’s opponent, Minnesota-Duluth, swept Miami to end the 2015-16 season and just went 1-0-1 vs. the RedHawks last weekend. The Bulldogs are ranked second in Division I. There is the legacy play. Miami has won at least 12 games in every season under Coach Enrico Blasi, and his worst two seasons from a wins standpoint were Years 1 and 3 (1999-2000 and 2001-02), when the team won 13 and 12 games, respectively. But that was with recruits from the previous administration. With his own players, Blasi has won at least 15 games each season, although two of the previous three campaigns have seen the RedHawks win exactly that many with sub-.500 winning percentages. So Miami needs to win on Saturday and advance to Minneapolis just to tie Blasi’s low-water mark in terms of wins. To be fair, the RedHawks have tied seven times, so essentially that have 12½ wins. But the team’s .379 winning percentage is 47th out of 60 Division I teams. 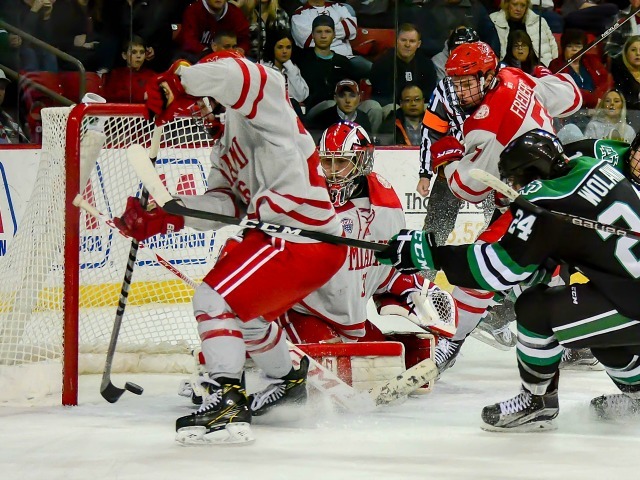 And hey, the NCHC’s lone knock – right or wrong – is the lack of an identity and natural rivals. North Dakota was one known quantity when this league was formed. The Native-American-turned-avion-nicknamed team has appeared in more championships than any team in Division I (13) and is second in titles (8). Oh yeah, UND won the national championship in 2016. Can Miami possibly get up to play this team on its home ice, even in a down year? 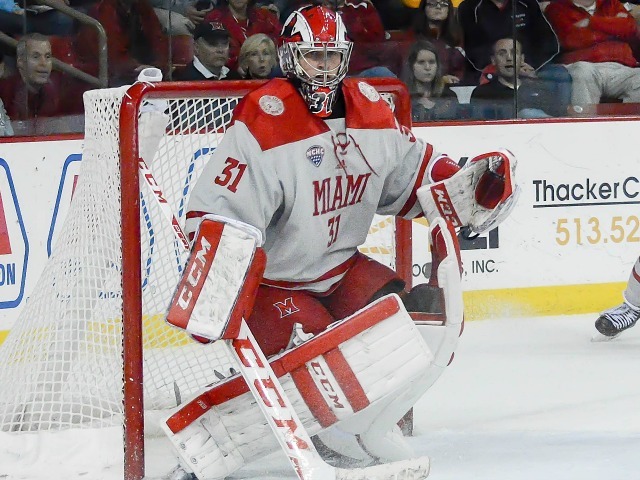 Miami’s Ryan Larkin makes one of his 38 saves on Friday (photo by Cathy Lachmann/BoB). Because the RedHawks didn’t do that in their penultimate home game of the season. 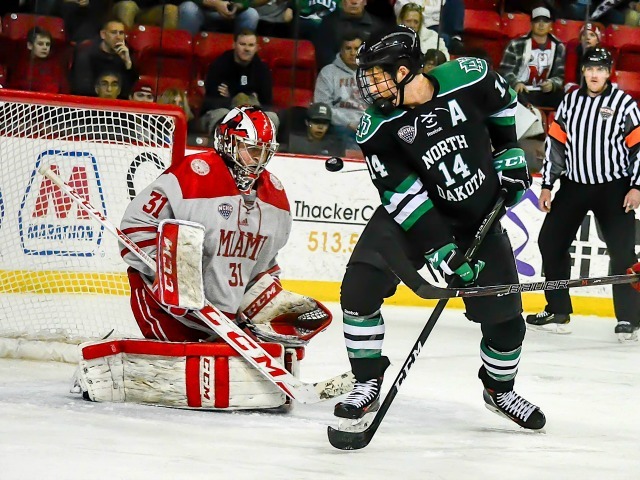 North Dakota had seven shots in the first four minutes, and if it hadn’t been for Miami goalie Ryan Larkin, it could’ve been 2-0 before many found their seats at Cady Arena. 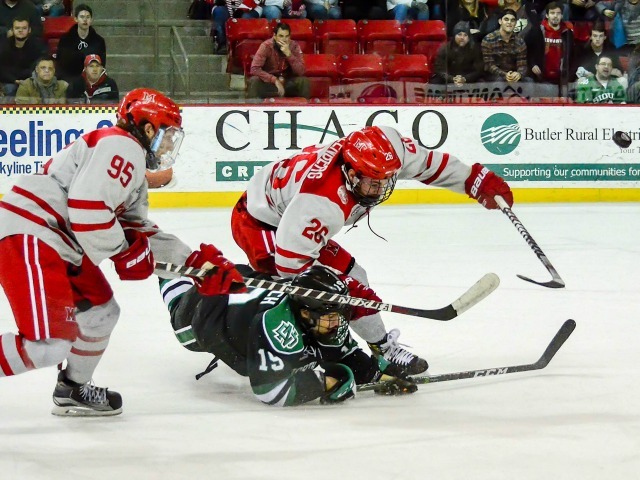 The RedHawks had their moments on Friday but there was zero sustained pressure. On the other side, the Other Hawks controlled the puck in the offensive zone for shift after shift. Shots on goal are not the be-all, end-all of hockey stats, but when a team is outshot by a 2-to-1 margin or greater in all three periods, that’s not a coincidence. The SOG by period was 16-5, 15-7 and 10-4. There’s the cliché that winning is contagious. Well, so is not winning, and Miami has failed to secure a victory in 11 of its last 12 games. 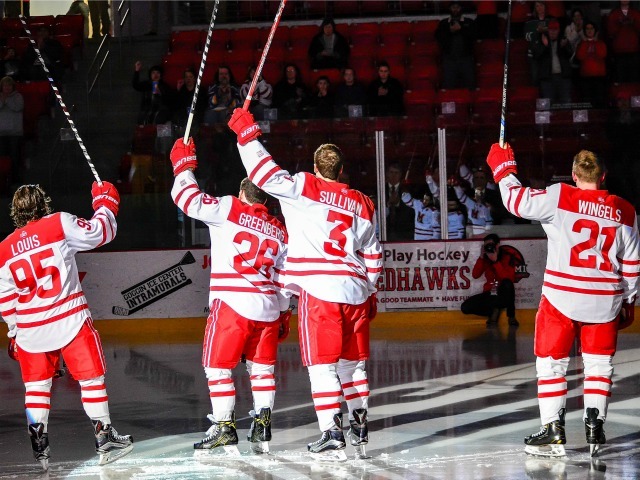 A win on Saturday won’t fix the RedHawks’ seed, or their PairWise or even do much to correct their anemic record, but it could point them in the right direction heading into the playoffs. – Time to dispel the “we’re young” excuse for Miami’s woeful performance this season. 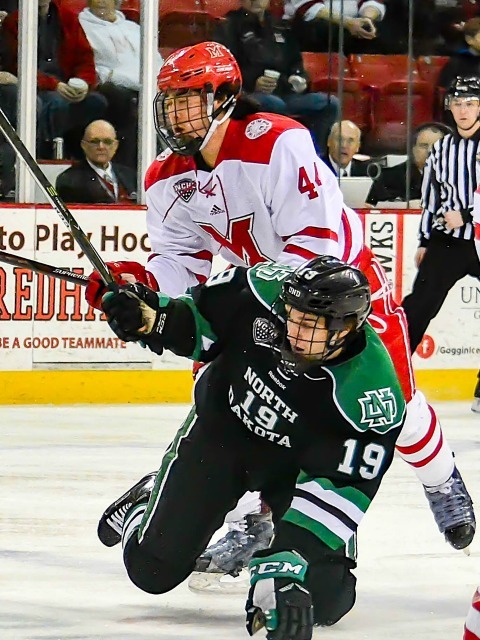 North Dakota has eight freshman and 11 sophomores – that’s 19 underclassmen, using the first two years of college definition – and five juniors and two seniors. One of those seniors is a goalie who has logged 18 career games. – If we’ve learning one positive thing about a player this season, it’s that Gordie Green’s work ethic is top notch. It’s easy to get off your game when the team you play for rivals the Jacksonville Jaguars in terms of winning percentage, but he has thrived while the team has done the opposite. Green has three goals and five assists his last eight games, and Miami only has 19 markers in that span, meaning Green has factored into 42 percent of those. He even laid a player out on Friday and was assessed a bogus charging penalty even though he neither lined his opponent up nor left his feet. – Impressed with Carter Johnson, who made a great move and just missed the net in the second period and had another quality scoring chance in the third period. Kudos also to Zach LaValle, who has continued to work as hard as anyone this season resulting in eight points in his last 16 games. 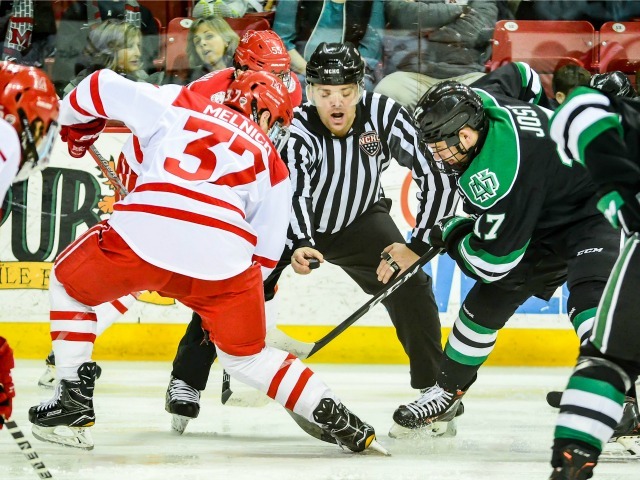 – With Louie Belpedio out, it was Josh Melnick who met with officials and UND captain Gage Ausmus during warm-ups. Very telling. – BoB is not big on criticizing officiating, but seriously, in this game, 7-to-2 on power plays including an extended 4-on-3 that led to the decisive goal? It was a chippy game, no doubt, but come on. That said, UND made the most of those opportunities, outshooting the RedHawks, 17-2 on the man advantage and scoring a shorthanded goals on one of Miami’s chances. – To complete the thought on penalties, Grant Hutton’s cross check to the head of a player laying in Miami’s crease wasn’t the smartest play of the season, and Conor Lemirande took three minors, eventually resulting in him being relegated to the bench for the balance of the third period. 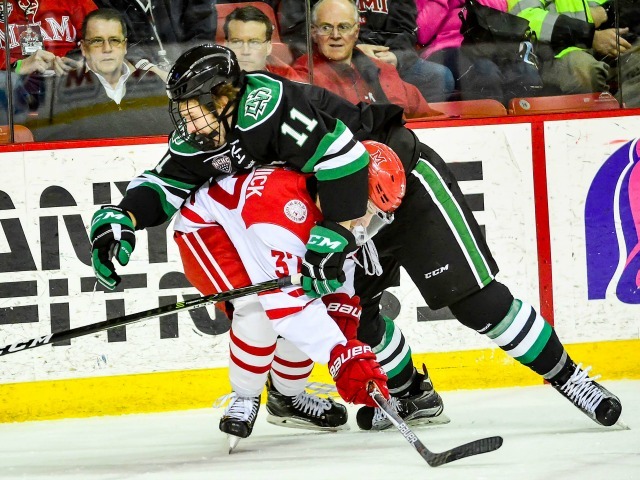 North Dakota a was better at getting under the RedHawks’ skin and watching MU get called for the retaliation. 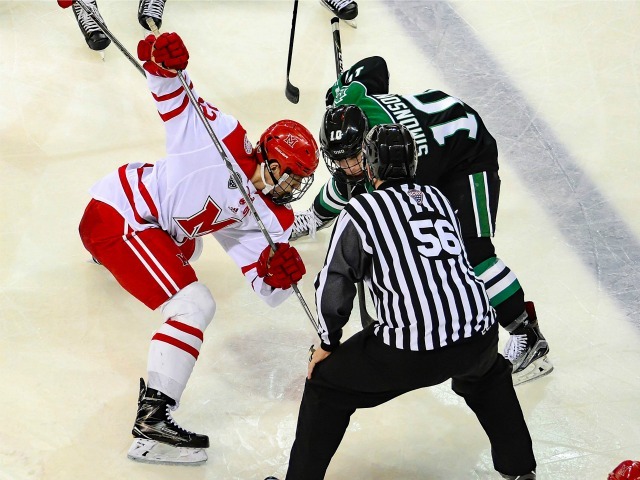 – With this being the first time seeing the Fighting Hawks live this season, their skating and puck control stood out as two of their top attributes. They also move the puck extremely well on the power play. Hard to believe they were just two games over .500 entering this weekend. As usual, their fans traveled well, as this was the loudest any opposing fan base has been in this rink all season. 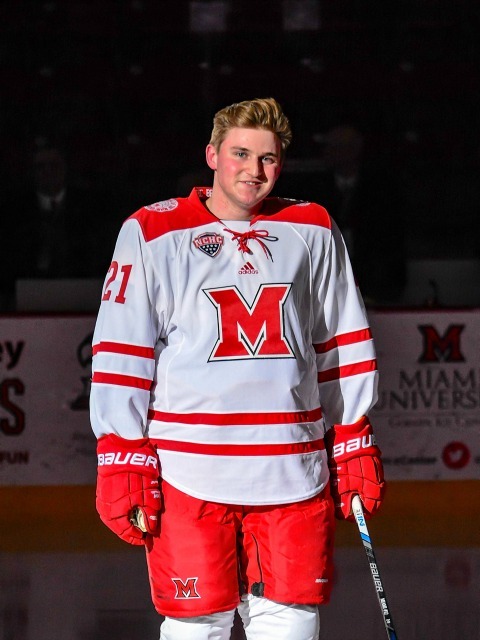 – With the regular season wrapping up, it’s about time we consider hanging numbers of more recent members of the Miami hockey clique on the brick wall at Cady Arena. For now, Andy Greene and Ryan Jones certainly seem worthy of having their respective 23 and 26 mounted in the Zamboni end. – Louie Belpedio was in the concourse wearing a knee brace. Sounds like he’s just week-to-week, but unfortunately for Miami, do-or-die mode starts next week for this team. Obviously his return would help tremendously. FORWARDS: C-. Just 12 shots from this group. The LaValle-Sherwood-Green line was undoubtedly Miami’s best. Overall, this corps wasn’t particularly impressive on defense as well. DEFENSEMEN: C-. The listed pairings bore little resemblance to how these blueliners were actually implemented in game. Scott Dornbrock had a decent game overall but coughed up the puck for the decisive breakaway goal. Other than an errant turnover, Grant Frederic played one of his better games. GOALTENDING: B+. Again, when a goalie faces 41 shots and many are Grade-A chances, three goals against is a pretty good night. Larkin kept Miami in the game by stopping the first seven shots he faced in the opening four minutes. Other than arguably the breakaway, there was little he could’ve done about any of his goals against. LINEUP CHANGES: For the third straight game, it was Alex Alger (F), Bryce Hatten (D) and Belpedio sitting. Hatten has been scratched for 15 of the last 16 games, so if Belpedio returns, it would be the expense of one of Friday’s starters on defense. With his forward corps relatively healthy, it appears this 12 from this game will be the group Blasi heads into the tournament with. 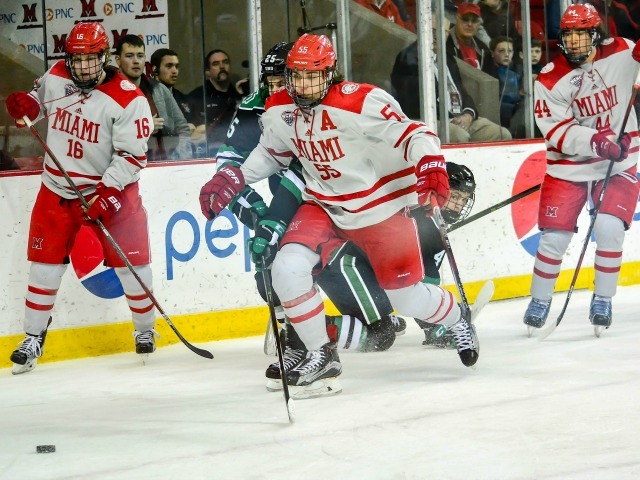 OXFORD, Ohio – Miami officially locked itself into the seventh seed for the NCHC Tournament. Consecutive No. 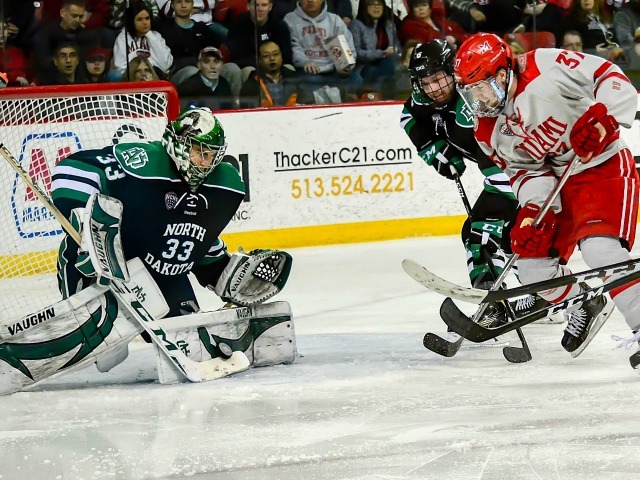 15 North Dakota goals late in the second period helped send the RedHawks to a 3-2 loss at Cady Arena on Friday. 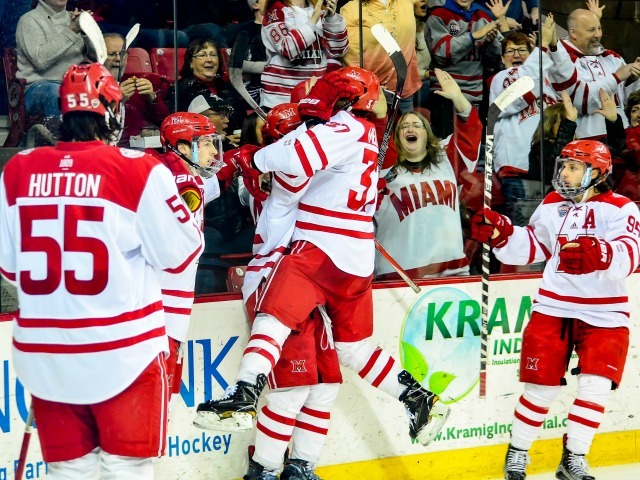 Miami will travel to Minnesota-Duluth next weekend for a best-of-3 series. The RedHawks, who extended their winless streak to seven games (0-6-1), are 1-9-2 in their last 12. 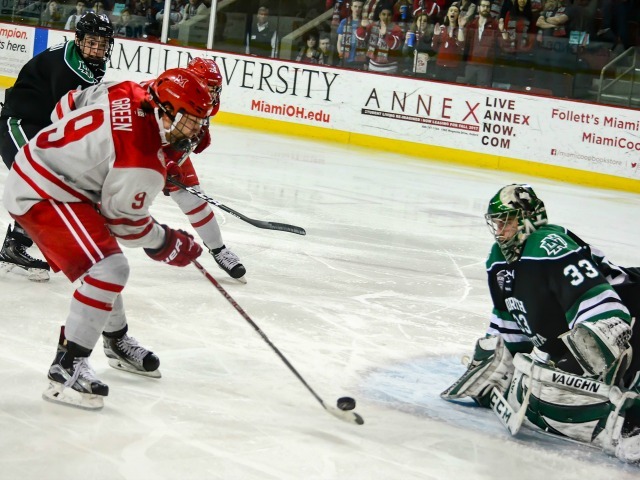 Miami’s Gordie Green goes in for a scoring chance on Friday (photo by Cathy Lachmann/BoB). MU (9-17-7) went ahead 7:38 into the first period. Gordie Green had an initial pass denied, but the puck came back to him and he ultimately fed it to Zach LaValle across the blue line. 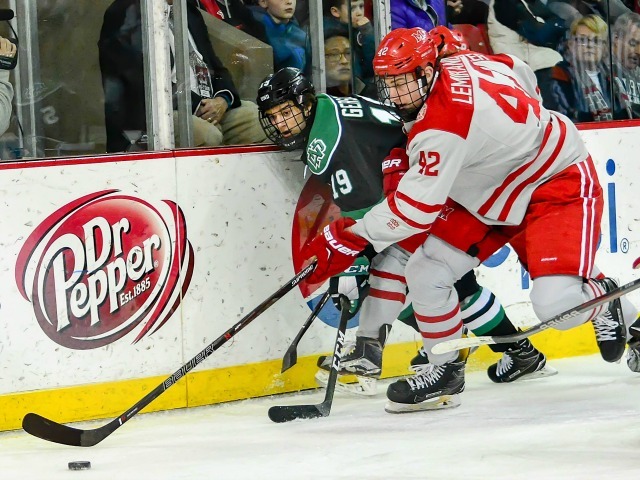 LaValle backhanded a pass through the slot, and Green advanced it to a wide-open Kiefer Sherwood, who rammed it home from the inside edge of the faceoff circle. 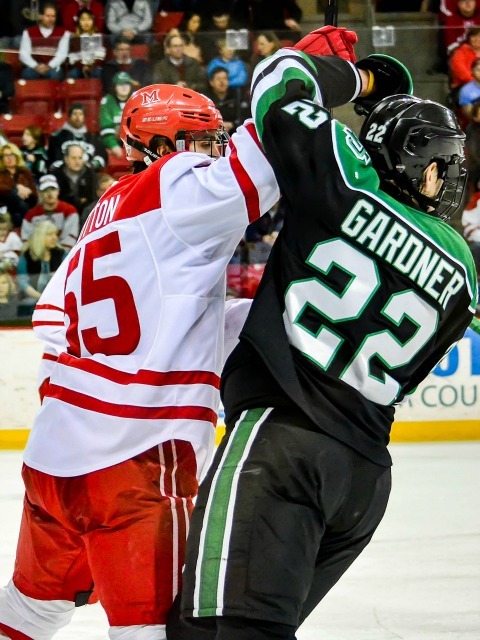 The Fighting Hawks (17-14-3) tied it on the power play with 2:11 left in the first period when Rhett Gardner connected on a pass to Chris Gardner in the slot. Gardner’s point-blank shot was denied, but Ludwig Hoff shoveled the rebound in on the backhand. The net was dislodged during the play, but after a lengthy review it was determined that the puck crossed the goal line first. Miami again took a one-goal lead midway through the second period. 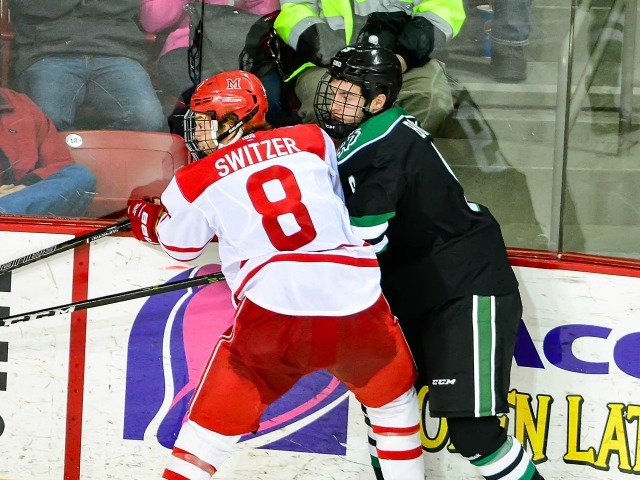 Kiefer Sherwood carried the puck through the neutral zone behind the North Dakota net before curling and connecting with Green. Green’s initial shot was blocked, but the rebound came back to Green, who stuffed it in the short side. Just 3:18 later, the Fighting Hawks again evened the score at two on a 4-on-3, as Tyson Jost whipped a wrist shot just under the crossbar from the slot. 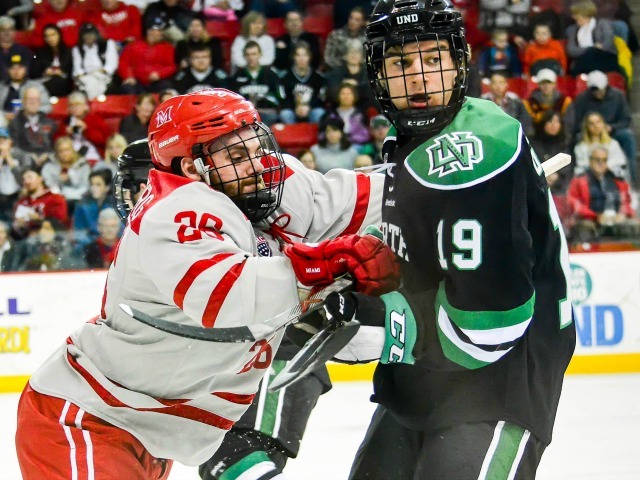 North Dakota took its first lead of the game with 1:40 left in that stanza when Trevor Olson stripped RedHawks defenseman Scott Dornbrock, went in for a breakaway and beat Miami goal Ryan Larkin on the glove side. 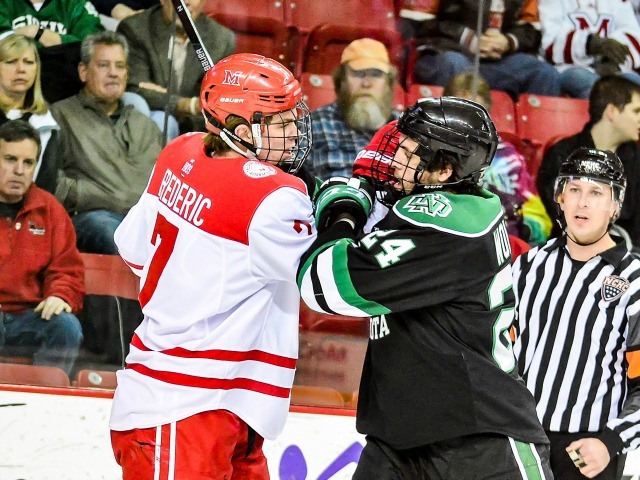 The Fighting Hawks limited the RedHawks to four third-period shots and 16 for the game while racking up 41 themselves. Green and Sherwood finished with a goal and an assist each. It was Green’s second consecutive multi-point game, as he now has eight points in his last eight games (3-5-8). Sherwood found the net for just the second time in 13 games but in his last nine contests he has recorded eight points. 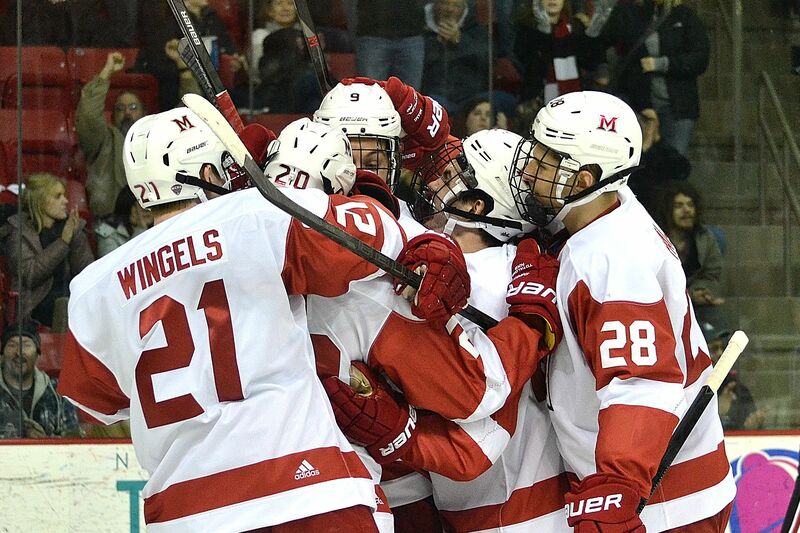 Miami dropped to 31st in the PairWise rankings and has 23 points in NCHC play. If the RedHawks had swept in this series, they could’ve improved to fifth or sixth in the standings. 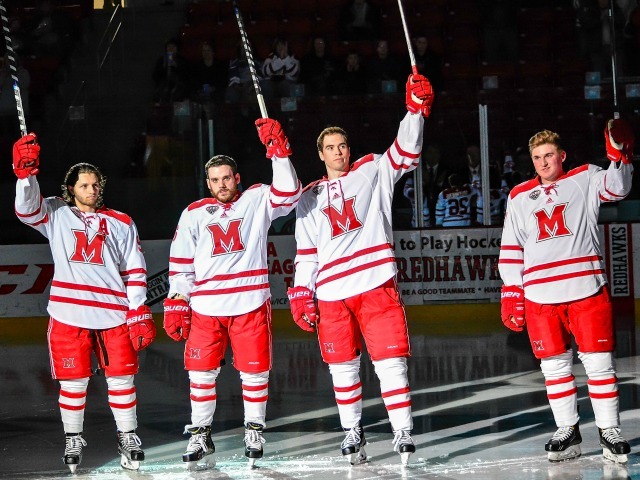 MU is 0-6-1 in its last seven games in Duluth, and last season the RedHawks were swept there in the NCHC Tournament, ending their season. Miami wraps up its regular season against North Dakota at 7:05 p.m. on Saturday in a game televised on Fox College Sports (DirecTV Ch. 608).